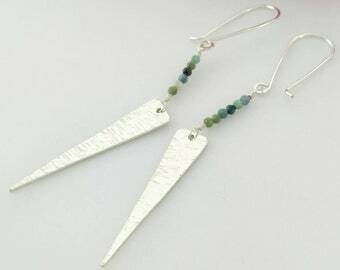 Beautiful, faceted turquoise and hammered sterling silver rectangles make these geometric earrings swing and shine! 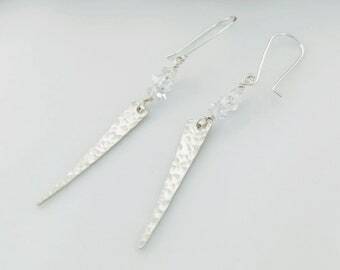 These beauties would make the perfect gift for you, your daughter or something blue for the bride. 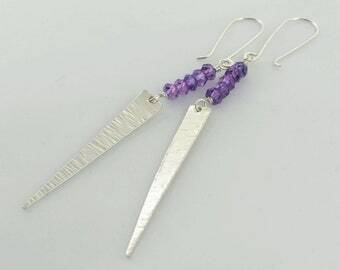 Ear wires are handmade and shaped from 20 gauge sterling silver wire. 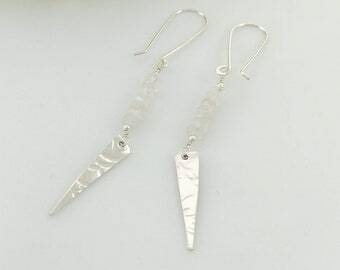 Sterling silver rectangles are hand formed, hammered for texture, and measure approximately 2 inches. Turquoise rondelles are 4 mm faceted beads. 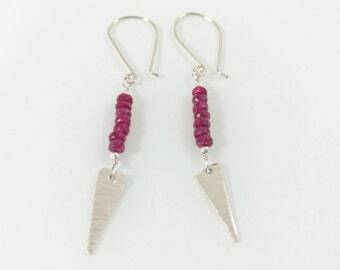 Each earring measures 3.25 inches from top of ear hook to bottom of earring dangle. 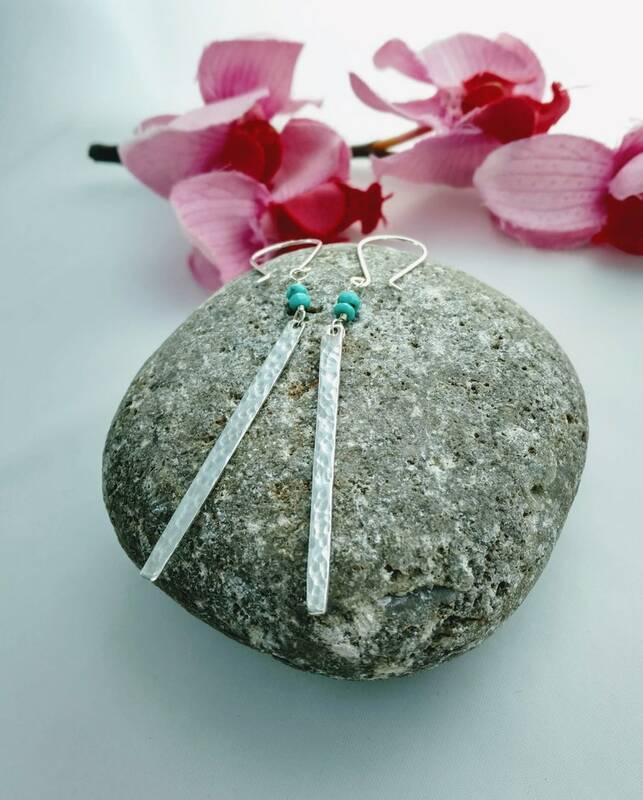 All components of these earrings, except the turquoise, are .925 sterling silver. All purchases come in a white box tied with purple and blue ribbons. Please choose this option if you would like extra special heart gift wrap! Our nana is very hard to gift and she loved her keychain. Gift very well received. Nice workmanship. • I do include a paper receipt in your order. Please mark your order as a gift and the purchase and shipping charges will not appear on your receipt. • Applicable and local sales taxes will be charged on all Ohio sales. • Ohio residents will be charged a 7.0% sales tax. 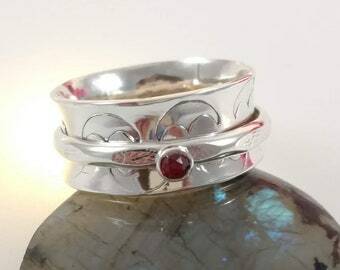 • Etsy handles all payment transactions. Your billing information is secured with Etsy. • I accept unworn and undamaged returns within 30 days of when the item was received. • Returns are not accepted on personalized pieces, unless I made an error. • Customized orders are non-refundable. • All Wedding Party Orders are final. I suggest purchasing a sample piece before buying all of the items you need for your wedding party. The cost of the first piece will be deducted from your total and the discount will include that piece. 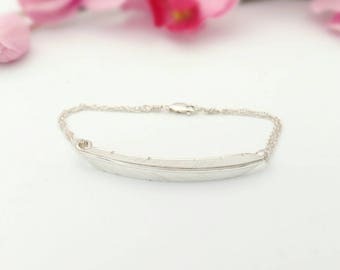 It is your day and I want you to love your bridal or bridesmaids' jewelry. • Items must be returned in original condition (unworn and undamaged) and properly packaged as received or a 20% restocking fee will be applied. • Please do not send any returns without notifying beccasblues first through Etsy's convo system. • Convo or email me before you send it back. • Shipping fees will be the customer's responsibility. • Refunds will be made in the form of the original payment through Etsy. • A credit will be issued for the merchandise amount only, shipping charges are not refundable. • Please allow 5-7 business days for the refund to post to your account. • For a perfect fit, you can send your necklace back to beccasblues and I will adjust it for you here in my studio. • I charge a re-work fee for each item I have to adjust. •I accept unworn/undamaged exchanges on orders within 30 days of when your package was received. • Standard shipping rates apply. • Please contact me to arrange an exchange. • Replacements will be made in case you receive the wrong item. • Please contact me immediately. *Note for international returns or exchanges: Shipping fees, customs dues, and other additional fees and/or taxes on international returns or exchanges must be paid fully by the customer. Once item is received back in original packaging, a refund will be issued for the purchase price. ♥ If you need your item sooner, please choose the expedited shipping option and I will ship Priority Mail. Please convo me for personalized orders first to make sure I can accommodate your request. • Ready to ship items will ship within 1-3 business days (excluding holidays) after you place your order. •Custom, hand stamped items usually take between 4-5 days for me to produce, but some can take up to 1 week. Please see estimated shipping times when ordering to know when you can expect your item to ship. You will receive a tracking number from Etsy email once your package is ready to ship. All orders are shipped through USPS First Class Mail, unless you have requested Priority Mail. Shipping time within the U.S. is normally 3-5 days for first class mail (Saturday delivery included!). • For any rush inquiry, please contact me. Please note: I can not guarantee delivery dates; there may be delays with the postal service due to weather or unforeseen circumstances. Please contact me with in 1 week if your package does not arrive and we will figure out where it is! You will receive a shipping notification from Etsy email once your package is ready to ship. All items are sent through USPS First Class International Mail; you may NOT have a tracking number for your package. Shipping time for first class mail is about 2-3 weeks (depending on customs processing in your country). On some rare occasions, your order may be held in customs for up to 4-6 weeks. Most country's Customs agencies open and/or assess fees to a random selection of packages. Any customs fees, taxes, tariffs, duties, etc. that may be incurred at the time of delivery would be at the discretion of your country's tax regulations. For any additional information please refer to your local customs agency. All packages will be marked Merchandise and show the price paid for the items. ♥ Shipping costs include shipping fees, as well as packaging materials! Each letter stamped on your personalized piece is hand stamped, meaning no two pieces are alike. I only use a hammer and other metal working tools, metal stamps, and my hands in order to give each piece a perfectly, imperfect look. Please note that I do not accept returns on pieces due to the stamping aesthetic. Laser-created engraving designs are recommended for a perfect, even, and exact look. All of my cuff bracelets, bar pendants, and initial charms are cut, filed, and finished by me. This means that there will be slight differences between each finished piece. I love custom and personalized orders, please don't hesitate to contact me if you are dreaming of a piece of jewelry and need help making it a reality! All beccasblues' purchases come beautifully packaged and ready for gift giving! If you would like me to include a personal gift message, please leave this information in the "note to beccasblues" box at checkout. How to Care for your beccasblues’ jewelry: Please take care and remove your jewelry before exercising, swimming, bathing or any use beyond light activity to preserve the life of the jewelry. All silver and gold jewelry should be properly cleaned occasionally with either silver or gold cleaner available at retail locations. Dawn dish soap and warm water can be used to clean all pieces. I recommend using Copper Bright or any other copper polish on copper jewelry, but lemon juice and salt mixed into a paste can be used in a pinch.